and about the context in which they exist." Award-winning Ceramic artist Regina Heinz has created a luxurious range of architectural ceramics – conceived in a new contemporary idiom – that offers a unique fusion of sculptural form, colour and design. Her innovative 3D feature walls, developed in her South London studio, are a distillation of her work as an artist, sought after by commercial and private clients alike. Whether as site-specific art work or forming a whole wall, the wonderful sensual surface of the tiles adds texture and a sculptural quality that animates each plane with rippling patterns of light and shadow. Regina's wall sculptures are a contemporary take on the ancient traditions of architectural adornment and combine a modern design approach with superb craftsmanship and artistic sensibility. The fusion of traditional and contemporary aesthetics results in timeless designs that lend themselves to both contemporary and more classical architecture. 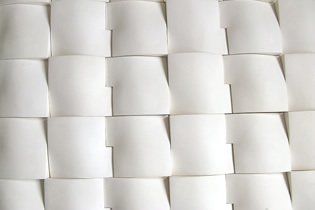 Regina offers a ceramic consultancy service and can be commissioned to create one-off installations and tailor-made prototypes for new shapes, designs and surfaces. In addition to creating complete artworks, Regina Heinz offers a unique design service that covers all aspects of product development and includes initial requirements gathering, development of client-/site-specific patterns, designs and colour palettes. 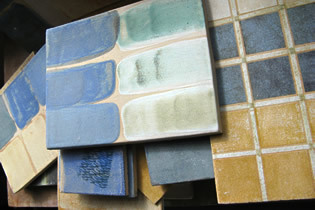 Clients may choose colours, designs and surfaces from a technical palette in response to individual requirements. The sculptural tiles are available in a range of finishes including hand-painted, high-gloss and matte glazes, gold and platinum enamels, transfers and ceramic printing. Please get in touch to start the communication leading to your highly individual "Art in Architecture"